The Marjorie Basden High School in South Caicos is known throughout the Turks & Caicos Islands for its achievements in academics, student representation in national events, music, and sports. In fact, several of the nation’s highest ranking politicians, including the country’s first female premier Hon. Sharlene Cartwright Robinson, graduated from its hallowed halls. The school’s namesake, Mrs. Marjorie Basden, at the stately age of 92, still lives in South Caicos. The following overview of her life reflects why her influence on the country’s education system has been so strong and long-lasting. 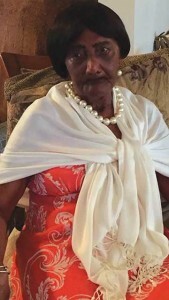 Marjorie Basden still lives in South Caicos at the age of 92. Mrs. Marjorie Lightbourne-Basden was born in South Caicos on August 1, 1924. She attended preschools of the late Miss Mary Robinson and of the late Mrs. Euphemia Lockhart. At the age of seven, she entered the Government All Age Primary School, headed by the famous Principal Christian D. Powell. He had an outstanding reputation in the Islands in respect to education and discipline. Following his death, Mr. Kenneth Malcolm took over the headship of the school, but he was soon replaced by Mr. Arthur Tatem. Mr. Tatem quickly identified Marjorie’s talent and gave her the opportunity to sit First, Second and Third Preliminary Examinations. This required her having to travel to Grand Turk on the mailboat, Kathleen, to write her examinations, as this was the only Examination Center in the Islands at the time. She was successful in all three examinations. Her desire was to become a nurse, but this dream seemed a long way away. Like most students at the time, Marjorie developed a very close relationship with some of her classmates. These included Mr. Samuel Saunders, Mrs. Iris Stubbs (Tita), Mrs. Muriel Stubbs, Mrs. Jamima Seymour, Mrs. Gertrude Seymour, and Mrs. Della Basden-Fulford. This was an outstanding academic group, with a passion for Mathematics and Reading. Marjorie was one who was always called upon to assist her teacher. She probably didn’t realize that this was the preparation for an outstanding career in education. The kids also played games such as rounders and attended parties and Sunday School together. They were all followers of the Anglican faith. In 1936, Marjorie and Mrs. Iris Stubbs became pupil teachers. They taught with passion, dignity and pride. The salary was the least of their worries. They were disciplinarians but also developed a good rapport with parents. They cared for their students and produced some of the best professionals in the Islands from South Caicos. Mrs. Basden was highly respected in the community. When students saw her on the street, they would stop doing whatever they were engaged in and pay her due respect. If she felt that they were idling, she would send them home. They had to obey her instructions. In the classroom, she was one of the “sweetest” and “loving” individuals a parent could entrust with their child. This did not prevent her from sparing the rod where necessary. She benefitted from numerous in-service training courses including First Aid, Shorthand and Bookkeeping. She retired in July 1980. On February 13, 1945, she married Mr. James Lightbourne. This union produced two children, Lincoln and Rosita. Following the birth of Rosita, her husband moved the family to Nassau, Bahamas in search of a better livelihood. Here, he was gainfully employed by the late Wallace Grove on Little Whale Cay. Marjorie became headmistress of the little school where the Grove’s children were enrolled. She also taught Sunday School and held evening classes where she taught the Three R’s along with needlework and embroidery. After some time, the Groves decided to relocate to Grand Bahama. Marjorie’s husband thought it best she return to South Caicos and said he would soon follow. This did not happen until forty years later. Marjorie Basden’s life was not without challenges. Early in her life, her mother left South Caicos and moved to Grand Turk to seek employment, leaving Marjorie in the care of her grandmother. However, because of their maternal bond, her mother soon sent for Marjorie. This bond was soon to be broken. Her mother fell ill and decided to send Marjorie back to South Caicos while she went to Salt Cay to be cared for. Unfortunately, she never recovered. Soon Marjorie’s beloved grandmother died, leaving her in the care of her grandmother’s sister, Susan Wilson-Williams. Her aunt’s husband Nathaniel (Uncle Nun) planned to send her to pursue her nursing career in Jamaica. However, disaster struck once again. In 1945, he passed away, shattering her dream. Mrs. Marjorie Basden has been the recipient of several awards. She was one of the first recipients of an award from the Native Men’s Fellowship in Providenciales. In 1993, she received the Badge of Honour from Her Majesty The Queen, Elizabeth ll for her number of years as an educator. In 1990, the Pierson High School was re-named in her honour as Marjorie Basden High School. She was also honoured by the school in November 2015 at their annual Anniversary Service. On October 10, 2016, she received the Long Service Award as teacher by TCI’s National Honours and Awards Committee. Despite being the second oldest resident of South Caicos, Mrs. Basden continues to be active. She served as an Invigilator for the Grade Six Achievement Test (GSAT). She also invigilated the Pitmans Examinations, General Certificate in Education (GCE) and the Caribbean Examinations Council (CXC). She still writes character references for individuals as well as providing historical information to persons about family ties and the Islands. She is regarded as the family matriarch and is often resorted to for advice and guidance. She loves preparing meals and reminds those who cook of the proper way to go about it, as in her words, she loves “good” food. Despite not having the opportunity to benefit from formal training at the time, Mrs. Basden can be described as an outstanding teacher. She is living proof of her philosophy that “teachers are born.” When one looks around and see the quality of students that have passed through her hands and what little or no resources she had to work with, it is evident that she possessed that special gift. Marjorie Basden’s name is synonymous with education. She will go down in the history books as one of the greatest teachers South Caicos has ever produced. Carlton Mills was born in South Caicos where he obtained his early education. He graduated from Excelsior Community College where he pursued a Certificate in Education. He also obtained a Certificate in Public Administration, Social Work and his Bachelors Degree in History and Sociology. He holds a Diploma in Education from the University of London, and a Masters Degree in Education from the University of Bristol and a Doctorate in Education from the University of Sheffield. Dr. Mills served as principal of the Marjorie Basden High School (1990–92), being the first Turks & Caicos Islander to hold that position. He also served as principal of the Raymond Gardiner High School (1992–97) and deputy principal of the TCI Community College (1997–2007). In 2007 he was appointed Minister of Education, Youth, Sports and Culture. In 2015 he became Principal of the Long Bay High School. He and his wife Debby-Lee Mills own and operate their own school, Mills Institute. Dr. Mills is author of A History of the Turks and Caicos Islands. He has presented numerous papers at conferences in the Caribbean and the UK in addition to publications.